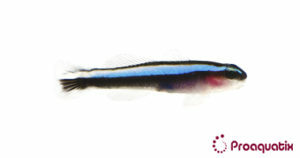 A bright blue reflective stripe runs through the length of this goby. Its body color is otherwise black dorsally and white ventrally. Blue Neon Gobies natural range extends from Florida to the Caribbean Sea.